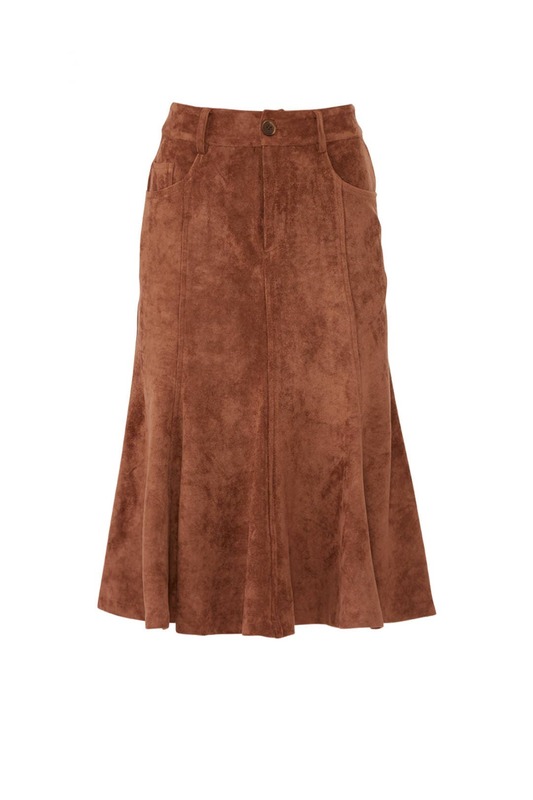 Luxe faux suede elevates this flared Slate & Willow skirt we love all fall. Style it with Nina Ricci's Small Black Youkali Satchel and the Romy Sweater DREYDEN. Brown faux suede (90% Polyester, 10% Spandex). 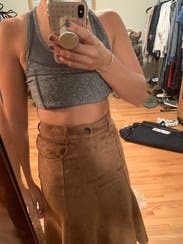 Skirt. Hidden front fly zipper with button closure. Pockets. 28" from waist to hemline. Imported. This skirt was super cute but ran small. I'm usually a 0 and it was too snug in the waist to be able to wear. Fit in the hips and everywhere else just fine. So I'd recommend sizing up one size! Great heavy fabric which lays nicely. Material is not exactly what I was expecting as it was a little stretchy, but that being said, it was definitely comfortable. The fit on the waist was great for me, as was the length. My only compliant is that the pockets and zipper on the front of the dress laid kind of weird on me. The bottom of the zipper fell on a weird spot and kind of poked out if I bent over or stood in a certain way (you can kind of see in the picture). Overall this was not enough to stop me from wearing it, but it would prob keep me from renting again. I love this skirt! So soft and comfortable. Something different and interesting from the standard pencil or tea length skirts! Loved the way it moved when I walked. Easy and comfortable to wear, fabric is nice quality. Runs slightly large, super comfortable. Can easily tuck shirts. 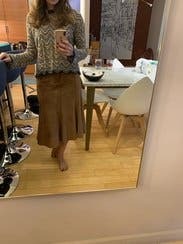 Unique skirt that is very flattering. It's a nice link and very flattering. I loved the heavy weight and deep color. Will definitely rent again. 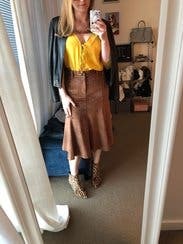 Such a fun fall skirt! 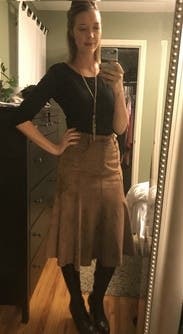 Wore this skirt to work and absolutely love it! Considering buying it for myself. It has a great flow, but the faux suede also provides some warmth. I paired with a cardigan and boots. I wore this to work in October and received several compliments on how sophisticated I looked. It has a lot of stretch so I think you could even size down. 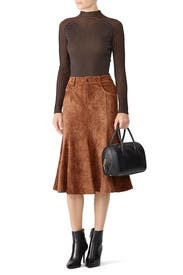 I'm purchasing as this is a Fall closet staple I didn't realize I needed. 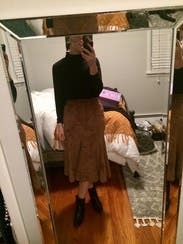 I loved this sophisticated Fall skirt. The fit was great but the pockets kept coming out. 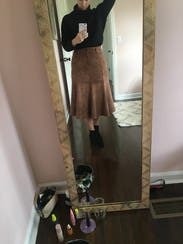 I liked this skirt a lot for a fall day. It is super soft and has a nice amount of stretch. I paired it with a sweater and and boots but you could dress it up as well. It runs true to size. a bit tight for me for work but the style was cute so I wore an untucked shirt over the waist and boots. Sky high waist, tight at rib cage. Like other reviewers, I found it to be VERY high waisted, and snug at the waist. Would not recommend if you have a short torso, or wide rib cage. Liked it more than I thought I would. I got this skirt for work and was a little nervous that I wouldn't like it because I'm short. 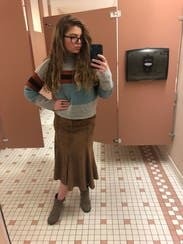 I ended up being pleasantly surprised and thought it was a great piece for fall. While I'm sure the length would be even better on a taller person, I still had several inches of leg showing which is all I cared about. It's comfortable, but I did find that it bunched up when I sat down and I'd have to adjust every time I stood up, which was my only real issue with it. Great skirt! Fits well and got many compliments! Great for work! 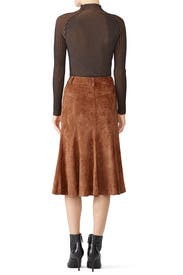 This is a beautiful fall skirt. I wore it out to dinner. It flows beautifully. The pockets do sit a little bit funny, but by adjusting the skirt down, I was able to get them to lay flat. I normally fit a 6, but probably needed an 8. I'm 5'7 145 pounds. This accentuates my unfortunate bloating but I love that you can wear it with thick tights and boots for cold weather. Other reviews commented that this skirt runs small, so I ordered an 8 (I'm usually a 4-6). This just hung on me and wasn't the high-waisted silhouette I thought it would be. I'll definitely try again in a size 6! I actually didn't wear this because I felt it wasn't flattering on a curvier, hippier body and wished it had had a higher-rise. The material was really soft, fairly stretchy - but it definitely runs the risk of looking way too cowgirl if you don't style it right! Runs small, and with a bulky zipper at the front, it wasn't flattering. Nice soft, thick fabric, though. Great fit on this skirt. The fabric is nice and heavy, and the skirt has great structure. This was a super fun piece for work. Very comfy! I paired with a black turtleneck and chunky black heeled boot. This was a cute, trendy look for work that did not overwhelm my 5 3 frame. Would rent again! This is great to pair with black tights and booties for a pulled together winter work look. Will definitely rent again. I ended up wearing a size up, as it runs small. I love the color and think the style is unique. The pockets do a weird folding in thing- lumpy- but I used a larger belt with it and that looked great. I would rent again. Perfect amount of stretch, fit like a glove - nice weight, heavy and good quality without being bulky. Loved it and got many compliments! The feel & material is great! Ordered my usual size 0 but it didn't work out well. It could also be that I've retained a lot of holiday weight but I won't go there lol The material is super soft & the length was really great for a petite frame. The color looked good with most sweaters I paired with it - especially cream or black. I'd definitely rent this again! 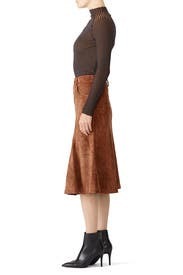 I wanted to love this skirt, but it's such a weird cut: high waisted and tight then glaring over the hips. Not flattering at all. I would recommend sizing up if you have larger hips like me. The 8 fits but it a bit snug in the waist/hips. 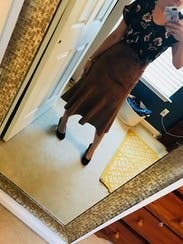 I like the skirt and it is a fun piece to mix into my wardrobe, but I don't love it. 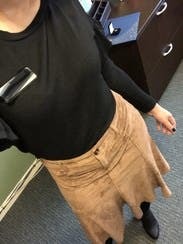 I loved wearing this skirt to work. It's the perfect weight for cold weather and looks great with black tights and boots. The length is truly a midi length, and the fabric looks and feels very luxe. Accentuates all the right places. I wore it many times and many ways. 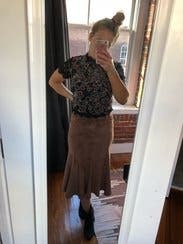 I wore this skirt to work and I felt great in it all day!! I normally wear a 4 or a 6, but the 6 in this skirt was too small in the waist and I didn't wear it. Fit well and looks great. Several complements. The picture makes it seem like the material would be stiffer but its actually really stretchy and moves a lot at the bottom.